I’m not the world’s biggest fan of Rock and Roll. I grew up (or as the pop music historians say “came of age” ) in the ’60s and of course I heard the music playing on the radio. But it was like tap-water: abundant, ubiquitous and to me boring. It wasn’t until I was in my 30s and the arrival of Punk and New Wave that I found Rock to be interesting. Better late than never I guess. But 10 years before that I’d been given the Velvet Underground’s album White Light White Heat by a roommate too offended by it’s sound to keep it. I on the other hand liked what I heard. Did I like it enough to buy the other Velvet Underground’s album The Velvet Underground & Nico... the one with the Warhol banana on the cover? Nope, I still wasn’t that big a fan. Nor did I read the WLWH album cover so I never knew that a guy named John Cale was a member of the band. So here we are 40 years later and Mr. Cale has slapped me up the side of the head again, and I never knew it was him that had done it to me the first time. I guess I should have paid more attention to the liner notes. But the message I’m getting now is itself almost 20 years old. It is being delivered by director Rob Nilsson in his 1990 documentary Words for the Dying and now reissued on DVD. The film is a mixed bag. The original plan was for Nilsson to follow Cale and producer Brian Eno as they worked on the album Words for the Dying, a record centered on Cale’s 1982 symphonic composition Falkland Island Suite. Oddly I already knew who Brian Eno was because back in the New Wave days, I branched out a bit and developed a taste for the band Roxy Music which originally included Brian Eno. In a way Eno is to Roxy and Brian Ferry like Cale is to Velvet Underground and Lou Reed. The plan to film these two musical mavericks while they made the album looked good on paper but straightway Nilsson is told by Eno that he does not want to be filmed while working. It’s Nilsson’s style to make that part of the story and the project hobbles along not so much thwarted as with an additional plot line added: “How are we going to spoof Eno and get him on film?” As if there wasn’t enough going on already. Cale performs the Falkland Island Suite in Holland and we get to see the bored reaction of some Dutch music critics. They tell us that Cale is over the hill. Thus encouraged, we follow Cale to Moscow where he and Eno will make a studio recording for the orchestral part to Falkland. Along the way we meet a character named Rodin, a Russian musician affected by somatomegaly or some other form of gigantism and who plays the double bass. The guys hands are so big it looks more like he’s playing a cello. It was difficult for me to tell if he was once a good player that has slipped or he is just so unique that he’s off in a zone by himself. Nevertheless, both Cale and Eno are impressed enough to write a chart just for him and then they spend considerable time trying to get something out of Rodin they can use on the album. Then it’s on to Wales where we get off-task again while Cale helps his aged mother sell the family home. Eventually we come around to Cale working with the Llandaff Cathedral School Boys Choir for the choral part of Falklands. Finally Cale himself gets in the recording booth to do his vocals. I thought this to be one of the most interesting bits as it shows Eno’s input into the production of the album. As Eno directs Cale, it is obvious that he’s got a very good idea of what works and maybe that is why Eno allows (finally) the camera to film him while in the recording studio. 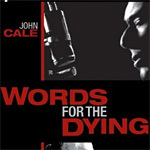 Words for the Dying (the film) ends with a meeting of Cale and Nilsson on the top of a treeless Welsh mountain with a picturesque ruined castle as the backdrop. Nilsson shows Cale the footage shot earlier in Amsterdam of the critics trashing him and his work (that’s gotta hurt). I learned later this confrontational style is part of Nilsson’s ‘reality’ school of filmmaking. The thing that would really make the nut here would be if it had been Cale’s birthday or maybe his dog had just died. But Cale coughs up a British stiff upper lip and essentially agrees with them. It seems to me that the film proceeds from two assumptions. The first is that you know what John Cale’s back-story is. Given that I’m a Rock & Roll illiterate, I didn’t appreciate a lot of the things that were going on around Cale. And the second assumption is that you understand Rob Nilsson’s filmmaking style which I take to mean being as ‘non-fictional’ as possible. So, since the film crew is there, it’s part of the story too. Simply having the cameras there changes the story. Or said another way, to pretend that they are not there is a falsehood. This is a documentary about the making of an album and not a doc about John Cale’s life, nor Brian Eno’s for that matter. But so much of what John Cale means to the piece is based on who and what John Cale was. For instance the Amsterdam critics seem to be most concerned with how much Cale has diverged from the avant-gard rocker he used to be. From their perspective, he’s lost his edge. So Nilsson on occasion must make quick historical asides but since those footnotes are not really part of the event it makes the film as a whole a bit of a muddle. Yet if he doesn’t footnote, then the film would be even more obscure to the uninitiated than it is. For me, the film is both revelatory and baffling and is one of those films that I consider a real stroke of luck to have reviewed for Movie Habit. It helped to put together the pieces of a puzzle that I didn’t even know was a puzzle and a pleasant reminder that the world is still a very wide place. Perhaps Nilsson’s unusual documentary was appropriate to Cale and Eno’s own unorthodox styles. The antique element to a nearly 20 year-old film was lost on me as it’s content was coming as fresh news but I suspect that the true Rock aficionados will appreciate this look back to another time and place. Here’s the bad news. There’s a really annoying (to me anyway) high pitched hum in a lot of the Moscow portion of the film. As this is a film about music, that’s not a plus. On the other hand the music that we do hear is either rehearsal quality or just bits and snatches of recording sessions so it doesn’t interfere with serious listening. But it is a distraction. This is a must see film for fans of John Cale and Brian Eno. Students of documentaries will be curious to see Nilsson’s particular take on that form and serious historians of Rock & Roll will see a lot more in it than I did. If you don’t have a dog in any of those fights, this film will be a bit of a puzzle.